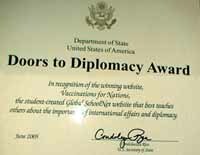 Each student team member of the winning “Doors to Diplomacy” Award team receives a $2,000 scholarship. The winning coaches’ schools each receive a $500 USD cash award. Each winning team member and coach receive a special certificate from the US State Department. Each team that completes a final entry will receive special Doors to Diplomacy certificates to recognize their achievement. Additional prizes may be provided by sponsors.